We all have limited time on this earth. Why not live it fully. Instead of wasting that time thinking about future and dwelling on past, why not enjoy this very moment. I know it is difficult to bring back every-time our mind wanders, it is better to teach our minds to stay in present . This way our lives would be more meaningful and happy. 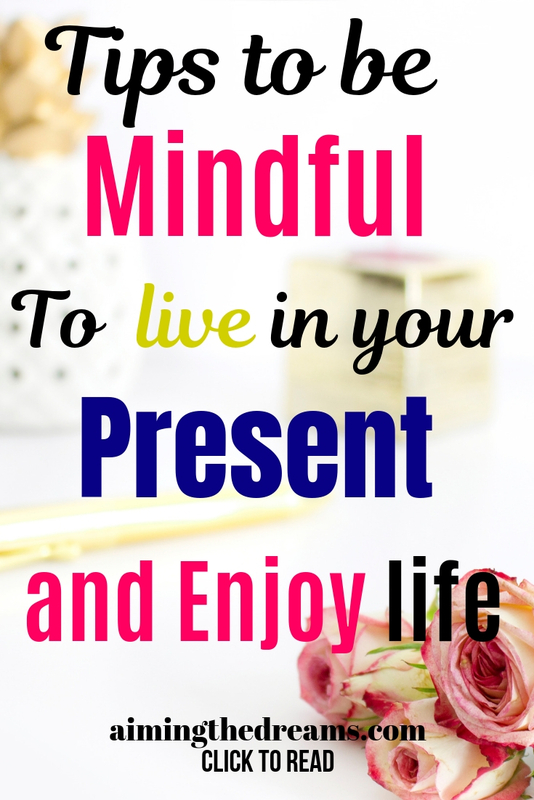 Being present in the moment helps to reduce stress anxiety and many more illnesses. It is known to improve memory because your mind is not absent from present. 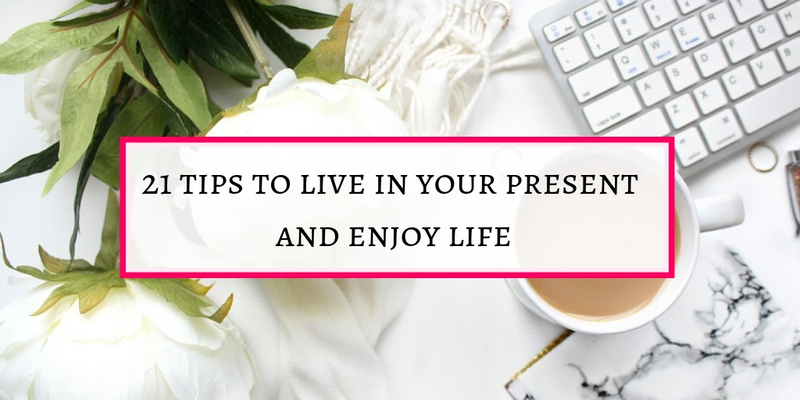 Here are some tips which will help you in living in present. Every morning brings new hopes and new day to start fresh. Leave your problems from yesterday. If you can find solution to them, better, if you can’t, just leave them. These things can be learnt gradually. And I totally understand, when we are in the midst of a problem, it is difficult to leave it. The problem remains in mind forever. The only way is try to tranquil your mind for few minutes everyday. It will help you in training your mind to stay calm. This is exactly how our thoughts are. We think too much about future problems which could arise. To think about future is good but worrying about the problems with a probability to come, is detrimental to health. These thoughts are the precursors for more complex problems like chronic stress and anxiety which leads to bigger health problems. Paying gratitude daily helps in living near to your own self. While paying gratitude, mind feels happy because you are having thoughts of what you have, instead of the thoughts of what you don’t have. You get to know what you HAVE which will diminish the thoughts of what you don’t have. You become aware of your present situation. Start paying gratitude today and you will be amazed at the results. It is human nature to live in past and relish the past moments. Past always feel interesting. The reason is that our minds don’t remember the hardships of past. Mind filters all the bad memories or problems and remember only the good things about past. This leads to always cherishing past. It is okay to think about your past as long as you are not always thinking about past and not enjoying present. There is nothing bad in thinking about past but if you feel like your present doesn’t even feel to you, then there is the problem. Whenever you feel like your mind has started feeling unhappy, try to bring it back and start feeling happy . It is difficult specially when you have lot of problems going in your life. Even then, set aside some time when you will only think about good things and feel happy, this will help you in learning happiness. Keeping grudges make your mind sluggish. If you always feel your self engulfed in anger and resentfulness, you will not be able to enjoy your blessings. Forgive others. If you think some relation is troubling you or making you miserable, it is better to stay away from it. Don’t just always think how bad your surroundings are. Try to forgive those who have troubled you in past and enjoy your NOW. Never live in any guilt. It is said that your physical being will start feeling the effect of negativity and it is better to stay happy and forgive others as well as your self. It is difficult to forget if you know that someone has hurt you. But forgiveness is not for somebody else, rather it is something you feel inside to release your own self from anger, resentfulness and the thoughts that make you suffer pain. Think that forgiving is not for the other person but it is for your own being. Your body and mind improves and you come closer to your present because the thoughts of bad past are not there. Keeping grudges keep you away from your present. It is a never ending circle. Sometimes overthinking about problems aggravate them. Find solution and if you cannot find solution, leave those problems. Thinking and rethinking about them will not do any good. If you cannot find any solution, stop thinking about it. Just forget it ( at-least practice it for sometime). Either solution will come to you or the problem will vanish. I am not talking about real physical problems, I am talking about the imaginary problems which we think that these may come to us. It is human nature to get attached to possessions. Souvenirs, clothes or items which you don’t use but keep for memories, takes a good space of your mind. 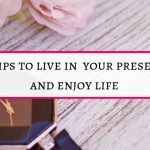 It is fine to have few things but if you start hoarding these possessions, you will not be able to enjoy your present. It is better to remove them one by one. You won’t be able to discard them all at once. But doing this gradually will let you stop thinking about those possessions.When you start removing those unwanted things in your life , your mind will be clear. Keep your mind as clear as possible to live a joyful life. Always staying under roof makes your mind sluggish. Go out. Feel the air on your face. Listen to the subtle sound of rustling leaves. Stare happily on swiftly swaying leaves with breeze. If it is rainy day, listen to the sound of falling raindrops. I mean these are the sweetest sounds of nature. Feel them and be with your present. Believe me, you will be surprised how happy you feel. Have you noticed how your surroundings look like ? If not, go out and have a look around your house. You have got beautiful surroundings, beautiful people, beautiful houses and trees around you, feel them. Say hello to your neighbour. Ask them about their well being. 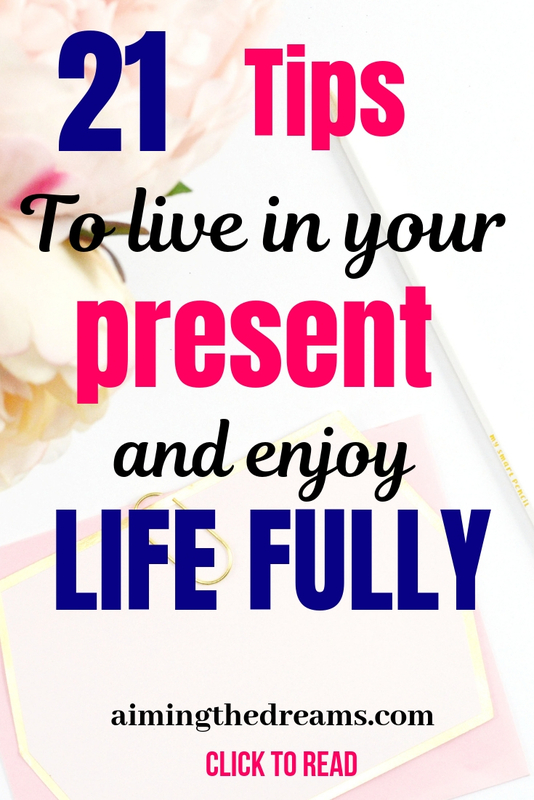 This will be your present moment. This one is real gold. You have to find a purpose to live your life. Without a purpose, your life will be like a leaf in air. It will go wherever wind will take it. Having a purpose in life will be like having a weight tied to the leaf. It will go in the direction where it will be thrown. Having a clear purpose will inspire you to feel this very moment. Meditation is something your mind and body will thank you for. If you have never practised meditation, start it now. Your mind will feel happy and relaxed after meditation. If you have never done meditation, read this post. Oh yes, never complain about what you do instead enjoy it. If you can change your work , go for it , if you are not on a position to change a job, start loving it. You will not feel miserable. Atleast this job is helping you pay bills and food on table. You may be thinking how procrastination can effect present living. If you pay attention to the moment when you procrastinate, you may find yourself dreaming about something else, most of the time. It may not the case every time but most of the time it happens this way. So learn to beat procrastination. Start removing clutter from your working table or your mobile phone. Then go for your desktop cleaning. Gradually start with your own room. Having less things will require less time and less energy to organise. In the mean time, start decluttering your mind. One of the most effective way of decluttering your mind is to write down everything on paper. Mind will feel free when you have dumped down your thoughts on paper. Come out of your comfort zone and do something that you feel is difficult. Now the question is , how does coming out of comfort zone helps in living in present moment ? Because when you try something new, you have to get fully immersed in that. Doing repetitive work let you feel bored and your mind start either thinking about past or worry about future. But trying new things will make your mind attentive. For trying new things, you have to pay attention to details and sometimes you have to learn new things. Being mindful of what you are doing. Paying full attention to the task in hand is the key to be present in the moment. Try to remember thins even while doing household chores. Enjoy cooking. Making tea. Drinking tea. Eating. To me, even the thought of drinking a hot cup of tea feels so good. This will let you feel that time is moving and you could feel it. A beautiful sense of your present will engulf you. As humans we always wait for something big to happen which will bring happiness. I am in the same boat. I always thought ‘ if this will happen I will be happy ‘. But actually, when the same particular thing happened, it never game me the same happiness I longed for. But I always fely happy and content whenever I wanted to. Now, I always try to find happiness in small day to day chores. Believe me, these little joys are actually giving me happiness. Crux of the matter is we should think about the small joys that come in daily life. Waiting for a big happiness is not going to bring happiness for you rather it will make you miserable. Be your best self and make smart decisions for yourself. Always focus on what you have and what you can do skilfully. Don’t think too much about what you cannot do. Rather get immersed fully in whatever you do and enjoy the process. Your inner self is your best friend. It always tell you what is the most correct path for you. Intuition or inner self is a feeble voice which sometimes tell you what to do and what is right for you but you go on ignoring your that voice. Don’t do that. Listen it carefully. Calm down and try to sit with your own self. That will let you feel the inside things. Please share if you like the post. I will really appreciate this gesture. Thanks and be happy always.